Lymphedema is swelling that occurs due to the accumulation of lymphatic fluid (also called lymph) in an arm, or sometimes a leg. Lymph is a watery substance given off by the cells. Under normal circumstances, it travels through the body through a system of vessels that parallel blood vessels. The lymphatic system also includes lymph nodes that serve to filter the lymph and remove waste, after which the lymph enters the bloodstream. If the lymph nodes or vessels are damaged, lymphatic fluid may accumulate in the surrounding tissues, which results in the swelling and discomfort. Lymphedema may occur at any point during or after treatment for breast cancer. Sometimes lymphedema is temporary, occurring just after surgery or after an injury to the arm. In other cases, it's a chronic condition that waxes and wanes over the course of one's life. Lymphedema may occur decades after surgery for breast cancer. It's hard to say how often lymphedema occurs with breast cancer. There is quite a bit of uncertainty involved with making the diagnosis, but it's believed that between 7 and 56% of breast cancer patients are affected, depending on the research. Also, lymphedema tends to adopt a variety of definitions depending on whether you are asking a patient to report on her own condition or asking a physician to make an objective assessment of its presence. Researchers agree that more studies need to be conducted to understand the frequency of lymphedema in women who've had breast cancer. Rare, inherited disorders in which the lymph nodes and vessels don't develop or function normally can cause lymphedema, though cases that arise this way are rare. More often, it's another condition, infection, injury or medical procedure that blocks or damages the lymph nodes or vessels. Infections are the leading cause of secondary lymphedema (cases that are caused by something else) worldwide; however, in the United States, the main cause of the condition is surgery or radiation therapy for breast cancer. Lymph nodes are removed from the armpit for biopsy via either a sentinel node biopsy or an axillary lymph node dissection. Surgery damages or cuts lymph vessels or nodes in the chest wall and armpit. Scar tissue from surgery blocks the flow of lymph through lymph vessels. Cancer cells migrate to lymph nodes, causing them to enlarge and interfere with their ability to function. Tumors press on lymph nodes or vessels and obstruct lymph flow. Anyone who has had breast cancer or breast cancer treatment can develop lymphedema. The risk is higher for women who undergo axillary lymph node dissection (more extensive surgery in which multiple lymph nodes are removed for biopsy) than sentinel node biopsy (a more limited surgery in which only one or two lymph nodes are removed for testing). The risk is also higher in women who have had radiation treatment or chemotherapy, as well as those who are overweight or obese. 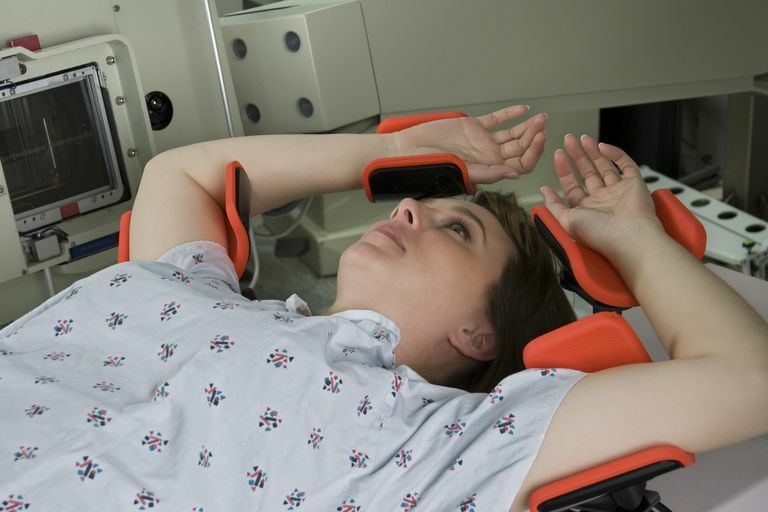 Imaging tests -- such as computed tomography (CT), ultrasound or magnetic resonance imaging (MRI) scans -- can resolve any lingering questions about the diagnosis. A test called lymphatic scintigraphy can provide additional information about the area of blockage. This test involves the injection of a radioactive dye and then recording images of the dye as it moves through the lymphatic system. Unfortunately, there's no outright cure for lymphedema. Instead, the condition is managed in an effort to minimize its effects by seeking to decrease the swelling, control the discomfort or pain, and avoid complications. Wear long sleeves outside -- and consider using bug spray -- to avoid insect bites. Even if your doctor hasn't recommended that you wear a compression sleeve, ask whether you should do so when traveling by airplane. Cabin pressure changes can worsen lymphedema. It's important to see your doctor if you think that you are developing lymphedema. Your doctor may also refer you to a physical therapist who specializes in treating this condition. Untreated lymphedema can have serious consequences, including severe infections, skin ulcers (open sores that don't heal,) and extreme swelling and thickening of the skin (elephantiasis). Lymphangiosarcoma, a form of cancer, was historically of concern for people who had breast cancer surgery. However, with the development of more sophisticated mastectomy procedures, this is nearly unheard of today. Ezzo, J., Manheimer, E., McNeely, M. et al. Manual lymphatic drainage for lymphedema following breast cancer treatment. Cochrane Database of Systematic Reviews. 2015. 5:CD003475. National Cancer Institute. PDQ Cancer Information Summaries. Lymphedema (PDQ): Health Professional Version. Singh, B., Disipio, T., Peake, J., and S. Hayes. Systematic Review and Meta-Analysis of the Effects of Exercise for Those With Cancer-Related Lymphedema. Archives of Physical Medicine and Rehabilitation. 2015 Oct 9.